Buy guns and ammo. Always be prepared, because Black Lives Matter savages will start creeping up on you! At least that is the message the Racist New Black Panthers have for police. They stood outside a Houston jail and screamed and hollered at the police saying they “will start creeping up on you in the darkness.” It seems as if they have already been doing quite a bit of creeping up. They are a bunch of violent, racist, race baiters who have already begun their murder spree. The best advice to everyone is to arm up and watch out for black people creeping up on you under the cover of darkness. If they creep up on you, defend yourself. Threatening the police that they would creep up on them wasn’t the extent of their ebonic rant. Using the word off as a verb, like only a ghetto thug can, they chanted in unison, “The revolution is on! Off the pigs! Oink! Oink! Bang! Bang!” We’re not describing a bunch of honor students here, we’re talking about blacks who have been purposefully dumbed down by liberals to enslave as voters. Keeping a group of people stupid and dependent on government also makes them sheepish and prone to group think. The black community has become a large group of brainwashed people who are easily swayed by the power of suggestion to do whatever the loudest one among them says. They have been brainwashed of any ability to think independently. Culturally, the left has turned the black community into a race of puppets. They empower a few puppet masters to pull all of the strings. The puppet masters are being upgraded. Al Sharpton and Jesse Jackson aren’t getting the air time they are used to having. The people of Ferguson, Missouri actually sent Sharpton packing. These race baiters aren’t violent enough to foment the true hate that the Obama Administration wants. The division has to be deep enough to cause a race war. Sharpton’s and Jackson’s days of merely demanding a piece of the pie are over. Violence is the goal now and they need new leadership to bring that about. New puppet masters. 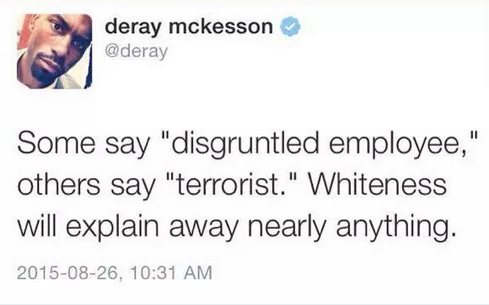 People like Deray McKesson, whose only claim to fame is quitting his job to become a full time hater and agitator. You won’t see Deray actually committing the violence he advocates. He likes to let others do the really dirty work while he sits back in the clear. He’s a coward. Much like a muslim who sends children into a crowd with a suicide bomb vest. Deray is garbage. A laughing stock. But he’s just the kind of leadership the Black Lives Matter crowd needs. Loud, racist, and hateful. On his own he can’t do jack. He needs a group of ignorant miscreants to do his bidding. Deray was an inspiration to the recent murderer, Vester Lee Flanagan who shot and killed two journalists, Alison Parker and Adam Ward and then also wounded Vicki Gardner, the innocent woman being interviewed at the time. Some were saying that Deray and Vester followed one another on Twitter, but that’s hard to confirm now that Vester’s account is suspended. Right after the shooting, Deray, the chicken that he is, tried to distance himself and the Black Lives Matter organization from the evil murders that his group inspired by claiming that Vester was white. He tweeted, “Some say ‘disgruntled employee,’ others say ‘terrorist.’ Whiteness will explain away nearly anything.” He later deleted his tweet when his lie proved to be too blatant to cover up. No one said “terrorist” and no one said “disgruntled employee.” Everyone said, black, racist, homosexual, just as Vester’s manifesto described himself. Vester also claimed to be starting a race war. This is what Deray wants. He’s just unwilling to be the patsy when there are plenty of willing pawns to do his bidding for him. Another, slightly more silent puppet master is Baltimore Mayor, Stephanie Rawlings-Blake who ordered cops to stand down and allow the savages to loot and burn the city. A responsible mayor would stopped the riots before they got out of control. Mayor Rawlings-Blake’s influence doesn’t reach that far beyond Baltimore though, except for causing a little more unrest among blacks with her rhetoric. Her overt inaction was her way of tugging on the puppet strings. Her puppets danced just as she dreamed they would. A good example of a new age, black puppet master is former New Black Panther Party Chairman, Malik Zulu Shabazz. He recently told a group of fellow Black Lives Matter savages that they “need to finish the mission of killing slave masters and their G** D*** families.” Again, like the other Black Lives Matter leaders who are willing to talk the talk, he is too afraid to walk the walk. His intention is to pull the puppet strings of the blacks whose lives don’t matter, inspiring them to commit violence. Over and over again the black leadership inspires their minions to go out and kill in the name of Black Lives Matter. The first actual killing under the Black Lives Matter banner was done by Ismaaiyl Brinsley. He shot his ex-girlfriend dead in Baltimore, then drove to New York where he killed Wenjian Liu and Rafael Ramos, two New York City police officers. This put a lot of smiles on the faces of a lot of bigots in the leadership of Black Lives Matter. 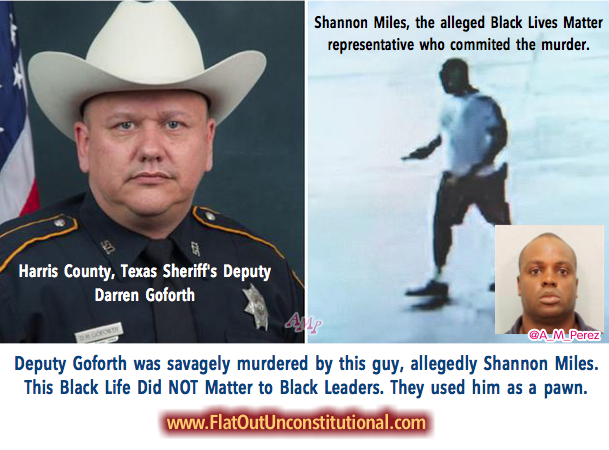 The latest black life that the puppet masters pulled the strings on is allegedly Shannon Miles, the man arrested for the heinous murder of Harris County, Texas Sheriff’s Deputy, Darren Goforth. Whether it is proven to have been Shannon Miles or not, one thing is certain: a Black Lives Matter representative followed the New Black Panthers missive to creep up on a police officer under the cover of darkness to murder him. Deputy Goforth was minding his own business filling his car with gas. His murderer crept up from behind, in the darkness, and did the unthinkable. Unthinkable until Black Lives Matter became a movement. Now it’s becoming all too common. This is sick and it’s intentional. The left wingers in power, such as the Obama Administration, cultivate this evil. They bestow a certain level of power to the leadership of the divisive, racist, Black Lives Matter and New Black Panthers movements. These leaders are then more than happy to pull the puppet strings to beguile their dimwitted pawns to commit acts of violence. The pawns get to feel like they are part of something big, when in fact they are nothing but dutiful rubes who get to take the fall. The Derays and Maliks are willing to sacrifice a lot of pawns. They could care less about black lives. Their goal and the goal of those in power who sanction them, is to create a division among the American people. Liberals divide and conquer according to the Alinski model. It’s how they hold onto power. For at least a generation, racism was all but dead and buried in the United States. Now Black Lives Matter is doing everything it can to stoke the racist fire and give people good reasons to become racists. When people of one race publicly demand a race war while killing innocent civilians, police, and journalists, it’s harder and harder for anyone to ignore the stereotype they are creating for themselves. Their leadership doesn’t care at all about black lives and to them, the less value that others place on black lives, the better. This week at the Minnesota State Fair, they chanted “Pigs in a blanket! Fry ’em like bacon!” Their chant writers aren’t really cut from the same cloth as Mark Twain or William Shakespeare. Remember when the Tea Party was accused by the entire media and the left for being a racist organization? Although there are black Tea Party members and no evidence whatsoever of racism, they were vilified. A black Tea Party member selling t-shirts at a Tea Party gathering was beaten to a pulp by the tolerant left wingers who saw him there. The IRS illegally audited Tea Party organizations and shut them down, so that they couldn’t participate in the election process like left wing organizations and unions could. We don’t hear a peep from the media today about the racism being spewed by Black Lives Matter, even though they have blood on their hands and admit that it’s race war blood. Yes, it is time to arm up, folks. Purchase firearms and ammunition. Learn to use them. Take some defensive weapons training, even if it is a refresher. If you are a certified trainer, offer discounts or even free courses for the elderly. Two Black Lives Matter savages just played the Knock Out Game on an old white woman inside a church. Conceal or open carry wherever you go. Always be on the lookout for a Black Lives Matter thug creeping up on you in the darkness, especially if he’s gay! Previous Open Letter to Andy Parker, father of Alison Parker. Next Iran Nuke Deal is Illegal. That’s a known fact, huh? I’ve known a lot of poor whites and I’ve never heard them blame blacks. I think you made that up. You did, didn’t you? I hear blacks blame whitey all the time. It’s not All Lives Matter, is it? No, only Black Lives. Why do you call yourself Black & Beautiful? Either you’re beautiful, or you’re not. What does black have to do with it? Why is race the very first word out of your mouth every time you speak, by using the name Black & Beautiful? It seems like you are trying to convince yourself, not anyone else. What is it about being black that you really hate? Whites have the highest suicide rate? Um, they have the highest population in America. Blacks are 13% of the population. Why do they have the highest MURDER rate? Go back to your precious black time. Next time you use the word “savage” remember Baltimore and Ferguson. Just type either city into Google images and I promise, you will be greeted with 1000’s of pictures of savagery. First of all, blacklivesmatter is not homogeneous group of black people so you’re painting a stupid picture of who belongs to that group and to the movement. Secondly, a more intelligent conversation would be about guns and the laws that control them not “creeping in the darkness” (which by the way, gas stations are very very well lit). The SUSPECTED killer of Deputy Goforth has a history of mental illness and there is no link between this man and #blacklivesmatter. Before you go blabbing your mouth away I think you should do some research. Or where you intentionally dumbed down by your alcoholic mother? I’m sorry, I shouldn’t have said that. I should love you for your you know no better. My one wish for you is to stop spreading hate against a group of people you don’t even know nor could possibly know. Finally, race was invented by us! We’re all, in fact human; 99.9% of our DNA is the same no matter the skin color. Being white doesn’t make you a good person nor does being black make you bad. Find help! Now! Ugh typos! Guess that’s what happens in the heat of passion. Or were you intentionally dumbed down by your alcoholic mother? I’m sorry, I shouldn’t have said that. I should love you for you know no better. What? I think you’re drunk. All gun laws are unconstitutional. Every single one. You are obviously a moron who can’t read the 2nd Amendment. Very funny. You rambled on, so that Americans can laugh at your stupidity. By the way, the number one threat to black people, is black people. Topping that list is black women. And the number one threat to white people? And like all ignorant people…name calling is not a valid form of argument. Make a point about what shows my stupidity! You can’t because what I’m “rambling about” makes sense and is true. Who’s laughing? Only the disillusioned which you seem to be. Great thoughts on a hard to approach subject.”Black Lives Matter” is modeled after ‘Isis”. Both send their Dumbest to get blown up or shot while the leaders stay away and protected. Yeah, LOL! Even when Juan got fired he couldn’t admit that PBS was wrong. It would have gone against the grain of his liberalism. Such a good article. Thank you for this… It perfectly states what so many of us are feeling these days but have been unable (or unwilling) to articulate.